It’s finally here, the moment sports fans have waited all year for, March Madness! This season has been defined by the unexpected, as ranked teams have been losing at an historic rate! (Just check out how drastically different the Midseason Edition of this article was!) So, to help you guys fill out your brackets, I will give you the Top-10 teams most likely to win the 2018 NCAA Tournament. Keep in mind that I created this list after analyzing the paths that each team could have, along with how well they have been playing recently, and, of course, how well they performed in the regular season. Without further ado, these are the teams you should pick to win your bracket! Arizona is led by two legit National Player of the Year candidates in Deandre Ayton (20.3 ppg, 11.4 rpg) and Allonzo Trier (18.4 ppg, 3.1 rpg, 3.3 apg). 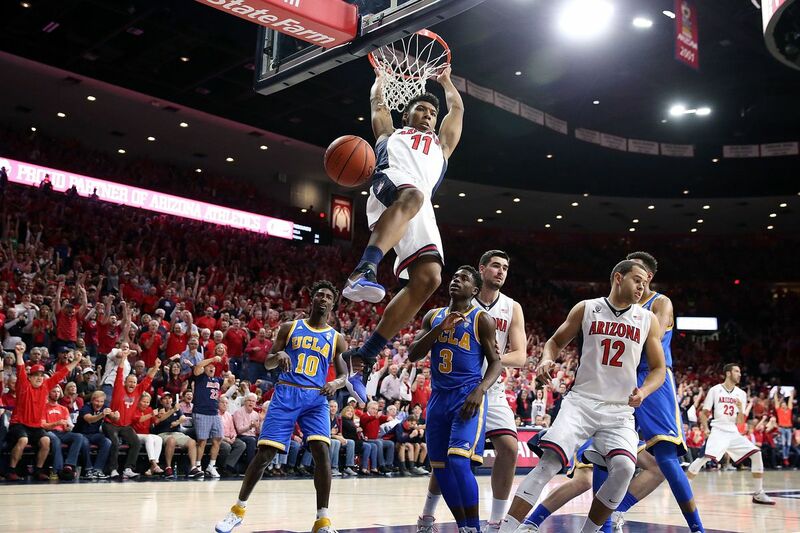 They ended the season easily defeating USC en route to their second consecutive PAC-12 Championship behind a 32 point, 18 rebound performance by Ayton. Arizona is definitely a team that could beat anyone on any given day, but they have one of the most difficult draws of any of the top teams. They play an upset-minded Buffalo team in the first round and then have potential matchups against, Kentucky, UVA, and Cincinnati all before reaching the Final Four. This team would be much higher on my list if they did not have to face that murder’s row of a schedule. 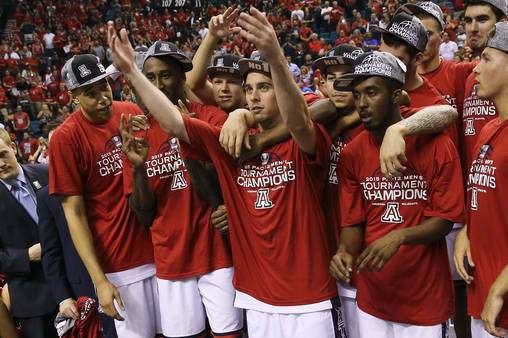 If you are looking to pick a lower seed to win it all, Arizona might be your best bet! For the majority of this college basketball season, Purdue looked the part of a National Championship Contender. Their season was highlighted by a 19-game win streak in which they defeated Arizona, Butler, and Michigan twice. However, most of the hype surrounding this team died down when they lost 3 games in row, by a combined 8 points, towards the end of the season. Honestly, I feel like this team is getting overlooked in the national spotlight. They have a bonafide star in sophomore guard Carsen Edwards (18.5 ppg, 3.9 rpg, 3 apg), a matchup nightmare in 7-2 center Isaac Haas (14.9 ppg, 5.6 rpg), and a tri of veteran guards in Vincent Edwards (14.5 ppg), Dakota Mathias (12.4 ppg), and PJ Thompson (7.1 ppg), who can all knock down their threes. What’s holding this team back is a history of failures in March and a sneaky tough draw. Purdue has never advanced past the Sweet 16 under head coach Matt Painter and a path that could go through Florida, a healthy Texas Tech squad, and Villanova would not be an easy one. Once again, John Beilein, has his squad playing its best basketball in March! For the second consecutive season, the Wolverines stormed their way through the Big 10 tournament, defeating the likes of Michigan State and Purdue, claiming another Big 10 tournament title. What makes this team so difficult to play against is their elite defense. Michigan has held opponents to just 63.5 points per game this season, good for 9th best in country. 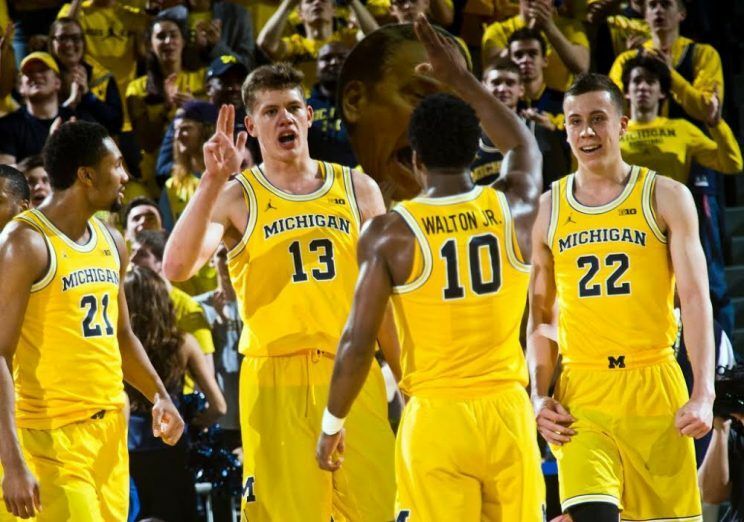 Mo Wagner will get his (14.5 ppg, 7.1 rpg) each and every night, but it has been the emergence of Muhammad-Ali Abdur-Rahkman (12.6 ppg), Charles Matthews (12.6 ppg, 5.4 rpg), and Duncan Robinson (9.6 ppg, 39% from 3) that has propelled this team into the National Championship discussion. If they can get past UNC in the Sweet 16, I think they will make it to the Final Four. 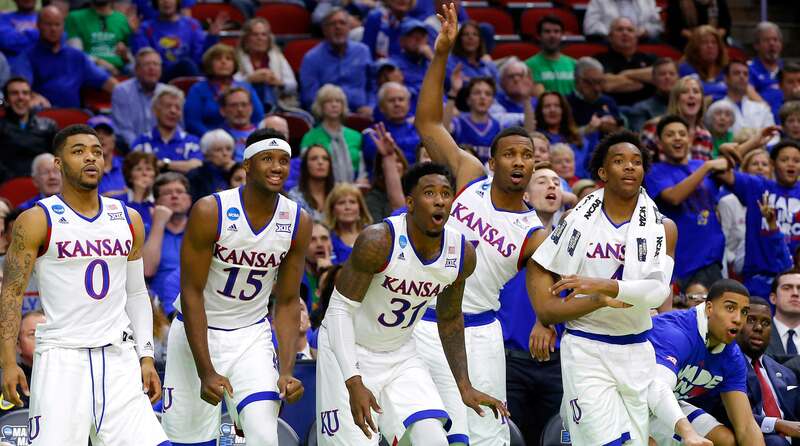 It seems like every year Kansas comes into the tournament as a heavy favorite to win it all. They just claimed their 14th straight Big 12 Championship and defeated West Virginia, for a third time this season, to win the Big 12 Tournament. The Jayhawks are led by an elite group of guards who can all shoot the 3 and score at will, including Big 12 Player of the Year Devonte’ Graham (17.3 ppg, 3.9 rpg, and 7.5 apg). His running mates are Svi Mykhailiuk (15.1 ppg, 45% from 3), Malik Newman (13.1 ppg, 4.9 rpg, on 41% from 3) and Lagerald Vick (12 ppg, 4.9 rpg, 36% from 3). The biggest question will be whether or not Udoka Azubuike will play or not after spraining a ligament in his left knee and missing the Big 12 tournament. This team is as dangerous as any, but all it takes is one cold night from 3 and they’re out. Not to mention, they potentially have MSU or Duke waiting for them in the Elite Eight. 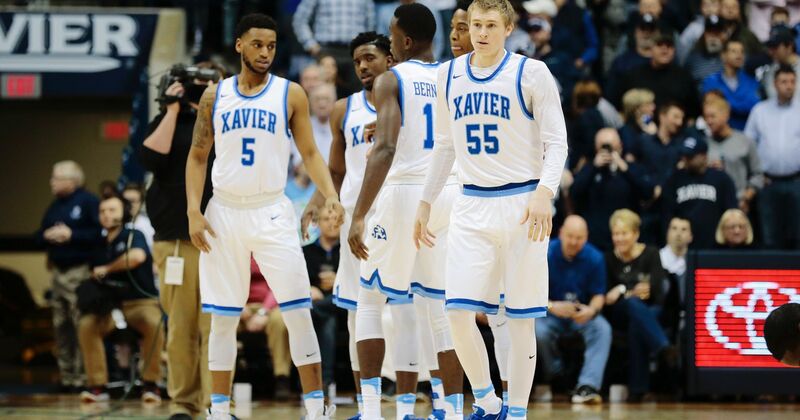 Xavier is a team that I have had a tough team buying into this season, yet they did enough to earn a 1-seed in this year’s NCAA Tournament. They are an elite offensive team scoring 84.3 points per game led by one of the most underrated players in the country in Trevon Bluiett (19.5 ppg, 5.7 rpg). However, their defense is suspect allowing opponents to score 74.5 points per game against them. They were also blown out by Villanova both times they played this season and suffered two tough loses to, Big East Tournament Champion, Providence. Do not completely overlook this team, but they are definitely the weakest one seed in the tournament this season and could have to play a surging Gonzaga squad as soon as the Sweet 16. The Tar Heels spent a large part of this season looking like a middle of the pack ACC team. They suffered a string of 3 straight loses to Virginia Tech, NC State, and then Clemson, which left analysts wondering if they should even be ranked. 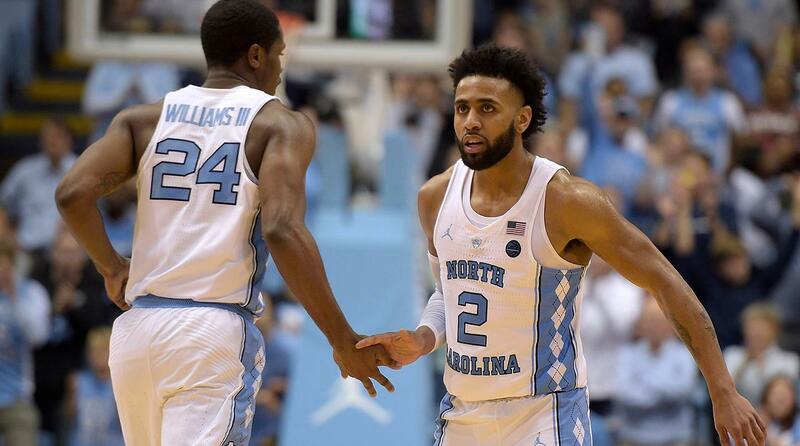 However, Roy Williams and crew turned things around pretty quickly and finished the season ranked as 10 in the AP Poll, defeating Duke 2 out of 3 times, and reaching the ACC Tournament Final. The Tar Heels will be a tough matchup for anyone as they are the number 1 rebounding team in the country (42.5 rpg), 5th in assists (18.2 apg), and own a top 30 offense (82 ppg). 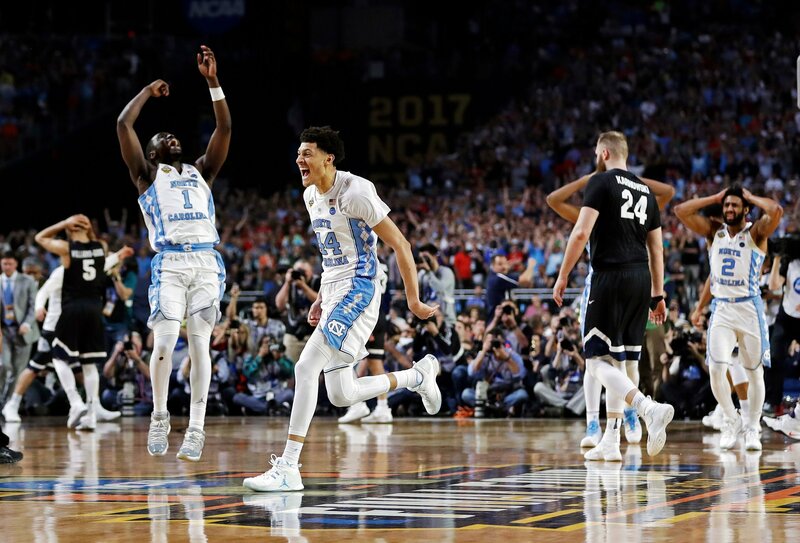 They are also led by an experienced core of players who have reached back to back National Championships in Joel Berry (17.1 ppg, 3.5 rpg, and 3.3 apg), Luke Maye (17.2 ppg, 10.1 rpg), and Theo Pinson (10.3 ppg, 6.4 rpg, and 4.8 apg). Not to mention, Roy Williams. Well, here we are. My pre-season and mid-season pick to win the National Championship. Michigan State has been up and down all year. They are ranked as the number 5 team in the AP Poll, yet their resume only earned them a 3 seed. Their best win of the season has to be the home win over Purdue, who was just coming off a tough loss to Ohio State. Either way, I believe this team has a ridiculously high ceiling that the leadership of Tom Izzo will help them reach. Sparty is led by two future NBA lottery picks in, Miles Bridges (16.9 ppg, 6.9 rpg, and 2.8 apg) and Jaren Jackson Jr. (11.3 ppg, 5.8 rpg, 3.2 blocks per game), but also bring a balanced attack by having 5 different players average over 11 points per game. Despite this, MSU’s defense might just be their team’s true strength. They are 8th in the nation in rebounding averaging 40.8 rebounds per game, block more shots than any other team in the country (7.4 bpg), and hold opponents to just 64.8 points per game (20th in the nation). 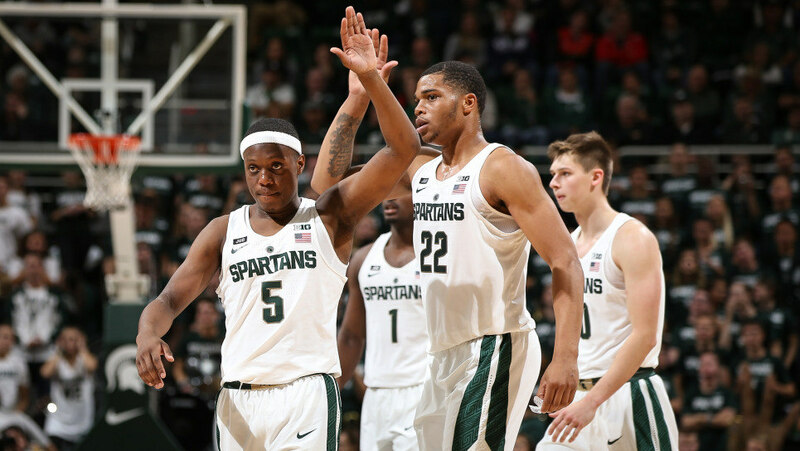 If Cassius Winston and Tum Tum Nairn can take care of the basketball, there are not many teams that can compete with the Spartans. Don’t look now, but Duke was looking like the most complete team in the country before a tough 74-69 loss to UNC in the ACC Tournament Semifinals. 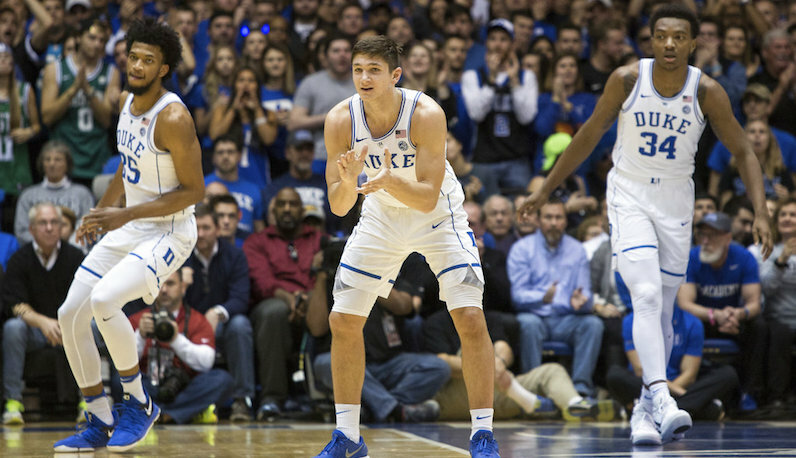 Despite the loss, Duke has shown some very good signs recently, making huge strides defensively. Early on, it looked like this young team would need to outscore every opponent, a recipe that makes it difficult come March. But, after committing to the 2-3 zone, the Blue Devils allowed just 61.1 points per game over their last 9 games of the season. Combine that with their 8th ranked offense (84.7 ppg), their elite rebounding (41.9 rpg, 3rd in the Nation), and their sheer amount of talent you get, what should be, one of the toughest outs of the tournament. Even if this team gets into trouble, they have two different players who can easily take a game over and carry them to victory in Marvin Bagley III (21.1 ppg, 11.1 rpg) and Grayson Allen (15.7 ppg, 3.5 rpg, 4.5 apg). It looks like this team is starting to reach its potential, but only time will tell if it results in another National Title in Durham. Amazingly, the Cavaliers began this season unranked. Many questioned if they even had the talent to make the NCAA Tournament. Fast forward to March, and they are the only two loss team in country and the, hands down, number one overall seed in this year’s tournament. With every Tony Bennett squad, it begins and ends at the defensive end. Virginia’s defense is by far the best in the nation, allowing just 53.4 points per game. Not only that, but they have not allowed a single opponent to score 70 points against them this season. 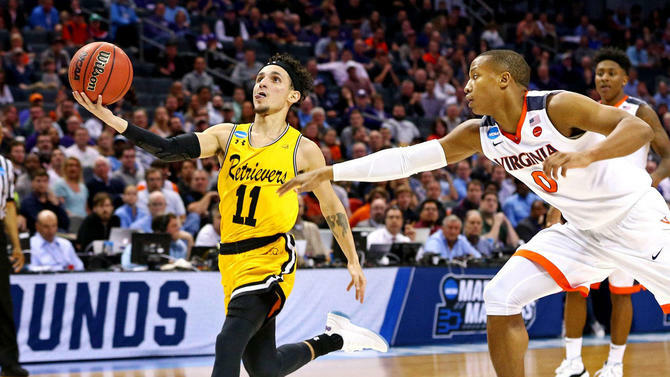 This defense alone should be enough to make them a Final Four contender, but UVA also has a pair of tough sophomore guards in Kyle Guy (14.1 ppg, 39% from 3) and Ty Jerome (10.5 ppg, 3.1 rpg, 3.9 apg) who can make shots from all over. This is a team that, in most situations, would be the closest thing to a lock to make the FInal Four as there is in college basketball. However, Virginia has been dealt a very difficult draw. They could face a very strong offensive team in Creighton in just the Round of 32, and then could have either Kentucky or Arizona waiting for them in the Sweet 16. Also, they just lost one of their best two way players and ACC Six-Man of the Year, De’Andre Hunter (9.2 ppg, 3.5 rpg), for the season after suffering a broken wrist. This team still has what it takes to cut the nets down, but things just got much more difficult for the Hoos. 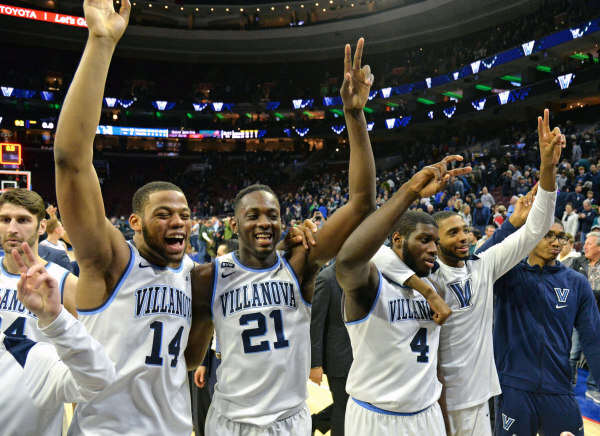 Villanova has become one of the great programs in college basketball over the last decade. Under Jay Wright’s watch, Nova has reached the NCAA Tournament all but once since 2004. They have won the Big East five times in that span, and four out of the last five seasons. And let’s not forget the memorable National Championship they claimed over UNC just two seasons ago. Well, this year, Villanova is back on the 1 line and I am here to tell you they have the best chance of winning it all this season. They own the number one offense in all of college basketball (87.1 ppg) led by National Player of the Year candidate Jalen Brunson (19.4 ppg, 3.1 rpg, and 4.7 apg) and future lottery pick Mikal Bridges (18 ppg, 5.4 rpg, 1.6 spg on 43% from 3), they are nearly impossible to slow down. However, Nova has two big weaknesses in their game. First, they own a mediocre at best defense, giving up 70.9 point per game which is good for just 141st in the country, so they need to score in order to win games. Next, is their lack of depth. Nova has six players who average over 10 points per game, but outside of those guys they do not have much. On most days, Brunson and Bridges can carry them to a win, but if they both struggle, Nova could very well go down. At the end of the day, it’s called March Madness for a reason. No matter how many games you watch or how much you study the metrics, you will always be wrong. It’s just the way it goes. Perfection in this game is impossible, but I will do my best to help guide you to your victory in your bracket! And if you’re looking for a bracket group to join, click this link to join our group for the chance to win a Steph Curry Davidson Jersey or an Allen Iverson Georgetown jersey!